This bespoke shirt was made for me at the end of last year by Burgos in Madrid. Burgos is one of the oldest and most famous shirtmakers in Spain, and one of very few still making by hand and using old-fashioned techniques. For more background on Burgos, see my piece on my visit to the shop. Burgos does not normally do fittings or trial shirts, unlike most other bespoke makers. 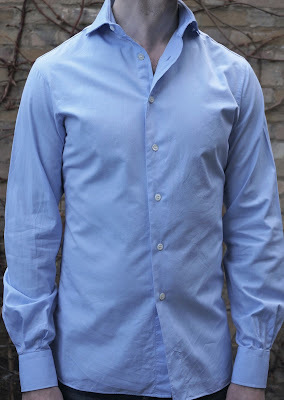 Italian makers, certainly those in Naples, tend to make a shirt with one arm and a temporary collar for a fitting. English makers usually create a trial shirt, with its cost made up for by a minimum order of 3-6 shirts. After having my measurements taken in Madrid, therefore, I received the finished shirt four weeks later in London. The fit, particularly the balance between the front and rear of the shirt, was good. Often shirtmakers cut the front of the shirt too large. Making it smaller can create a slimmer silhouette, with the bulk of the shirt in the back still allowing plenty of movement. Still, I would have preferred it slightly neater in the waist, and the collar wasn’t what I had asked for. We were going to experiment with a pointed collar that had a button underneath the point – sometimes known as a ‘button under’. What arrived was a simple point collar without the button. Carmen at Burgos was happy, indeed eager, to make the shirt perfect and she took it back, changing the collar (to the spread shown above) and narrowing the waist. It’s worth mentioning that Carmen is from the Burgos family but only recently joined the company, giving up a career in software. I’m sure this is a reason she is more professional than many other shirtmakers. The second shirt I received was pretty much perfect. All the details were right, the fit was great and the hand work was exquisite. There are a few things I would change slightly, such as the height of the collar at the front, the thickness of the interlining and the material itself, but these are all easy to do. Of the three makers I will review this week, Burgos is the one with the most flexibility. They do fused and floating, in different weights, and with any level of hand work. The following things were sewn by hand on my shirt: the sleevehead, the bottom edge, the buttonholes, the buttons and the collar. The most of the three shirts reviewed this week. The machine stitching was a tiny bit bigger though. Other interesting differences included the shape of the bottom edges of the front and back of the shirt, with the latter having a square shape but the former rounded (see picture above). The collar buttonhole was also surprisingly high on the collar, and small, and there was no gap for the tie between the two sides of the collar. Also, you can see from the photo below that the collar stand is cut straight but tapers towards the front – more than either of the other makers, which would explain why I felt the collar could be higher at the front. Finally, I requested a slightly unusual placing of my initials, vertically on the front of the shirt, and I think it’s fair to say that could have been straighter. Overall, an extremely well-made and well-cut shirt with a few niggling details that could be sorted out on a repeat order. Carmen will be visiting London on 15-16 March and New York on 11-13 of April, both with Lopez Herbon, tailor to the Spanish king. Contact camiseriaburgos@gmail.com. You can follow the discussion on Burgos of Madrid: Bespoke shirt review by entering your email address in the box below. You will then receive an email every time a new comment is added. These will also contain a link to a page where you can stop the alerts, and remove all of your related data from the site. Really interesting reviews Simon! Very appreciated. You being a customer of T&A, are you trying these new makers out of curiosity related to your “night job” as one might call this blog, or because you feel that T&A could do better i.e. be replaced? Obviously many more factors would be involved in such a decision but, personally, having been a customer of T&A for 10 years, I start to feel slightly annoyed by them never getting an order right the first time. I do not mean to rant but sometimes this “lack of professionalism” that you also address is exhausting. Any thoughts despite the fact that the grass always seem greener on the other side? Burgos is pure interest, given the age of the firm and the great level of hand work. But Satriano Cinque is a genuine search for an Italian maker that I can stick with and never change. I don’t think I will ever use an English maker again. There is little attention to detail and the collars are all so flat, terrible without a tie and pretty limp with one. I’m afraid the professionalism aspect is not something that is consistent in any country. Curious, Simon, is there any way we can get shots of you wearing your English shirt and then Italian shirt? It would be great to see what you mean by the differences in collars. If you look at previous pictures of me wearing a Kiton shirt (such as my profile pic, left) you can see how much higher the collar is and how pronounced the arch of the tie. You say “I don’t think I will ever use an English maker again”. Were you that unhappy with T&A? In earlier posts you seemed to praise them? I do understand you very well as one of my main fascinations with clothes cutting and thus, hand-made bespoke over mass is the ability to transform a flat sheet of cloth into a three-dimensional, nearly sculptural object. And yes, some of my T&A have terrible collars but the classical cutaway collars work pretty well. Also, I never thought that the collar and thus the shirt would make a difference to how the tie arches – is this not simply achieved by a good, tight knot? No the collar can make all the difference. If you have more than one type of collar, but tie your ties all the same way, you can see it pretty quickly. Simon as a long time follower of your blog it seems that as your tastes develop and evolve you move on to different makers, if this is a natural process which everyone entering this world will probably go through does this not add to the cost of the endeavour exponentially .. as the justification for many having bespoke items made is that an investment is being made and the longer life merits the high costs involved? You’re right, Marco. I suppose we all – certainly me – assume that we are necessarily finding things that are superior, and that a reader could just skip the initial mistakes and move on to the new thing. Then again, some of this is always a question of personal taste. And it’s hard to know what your taste is until you’ve lived it. Indeed, some men older than me would say they didn’t really discover their taste until they were well into their forties or fifties. Perhaps it is all a necessary, but enjoyable, journey. Hey Simon, I’m curious which part of the collar was done by hand? 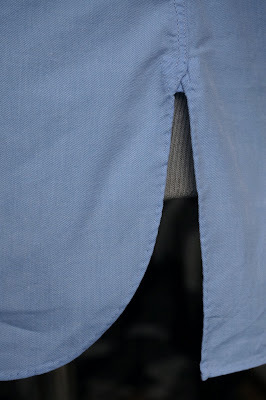 It appears that the collar was stitched using a machine but that the collar band was attached to the shirt by hand. Is that the case? Either way, pretty awesome! Could you please clarify your reference to fused/ floating with respect to the shirt? Do you mean the collar? Further, as somebody who wears a tie daily, could you please elaborate a bit further on how the cut of a shirt affects the way that a tie can sit? Finally, I think that this series is going to be tremendous, and would especially like to encourage further series on other aspects of shirts, specifically collars and cuffs. Yes, I mean the collar. Only the collar and cuffs have such lining and they will usually be the same as each other. The height of the collar band on the body of the shirt, the height of the band itself and the shape of the band along its length all contribute to how the tie knot sits on the neck. Generally, a higher and taller band will lead to the tie arching out that little bit more. But how much you can do that depends on the height of your neck as well. i think youre absolutely right, you only get to know if you like something until youve worn it and lived with an item for a while (like any relationship i guess). conceptually things might seem fantastic, but only by spending time wearing something you really know .. this ofcourse presents a problem as how do you find out if something will work without incurring huge expense and going round the mulberry bush! i guess many old school bespoke patrons would just use their fathers tailor .. great if the tailor works for you, highly inefficient if it doesnt. Simon, thank you for your review. I am glad you were mostly pleased with your shirt. We strive to give our customers what they want. As you know, this can be a bit of a process, one in which we are happy to participate. Let us know how we might finely tune the details on your next order. I’ve been getting shirts made from Burgos via their NYC visits, after having tried Finamore, Attolini, and Borrelli (MTM or bespoke), and I have to say I’ve been extremely happy with the results. After some tweaking to the collar and tightening the cuffs of the initial first shirt, they have fit perfectly. The collar buttons on all of mine are in the middle of the collar band, so I assume its a one off on yours. I like the tapered collar stand, as I asked for tie space and that way the tie knot is always above the band. As you say, they are extremely flexible and easy to deal with. My cuffs are attached by hand as well as the other parts you mentioned, which I’d guess is standard since I didn’t ask for that specifically. Just wanted to show my support, as it has been a process for me to find a shirt maker that ticked all the boxes as well. Seems done by an amateur blind person with Parkhinson and the ugly knot between the two lines of toptstitching is simply unaceptable . The fit is very bad, sorry to say, great page yours. Paco, the buttons are not plastic and you are wrong about the fit. I warned against concluding anything from the full-length photograph. Hi Simon, how will they provide a proper fit without fittings? If they do not get it right after the initial measurement, will you just have to settle? They can adjust it afterwards as well, though not easily take it out of course. I found the fit to be very good, but there’s certainly a greater risk there. Do you even get to try it on once before they finish the shirts or do they just take your measurements and give you the finished product the next time they see you? Hi Simon, I cannot tell in the pictures but does Burgos make their shirts with a split yoke? With respect, in my opinion the Burgos shirt is one of the worst bespoke shirt I have ever seen. The fit is really bad , too much excess fabric at the chest. The shirt has no skirt. The shoulders have no height correction. The button stance is off and is not straight. 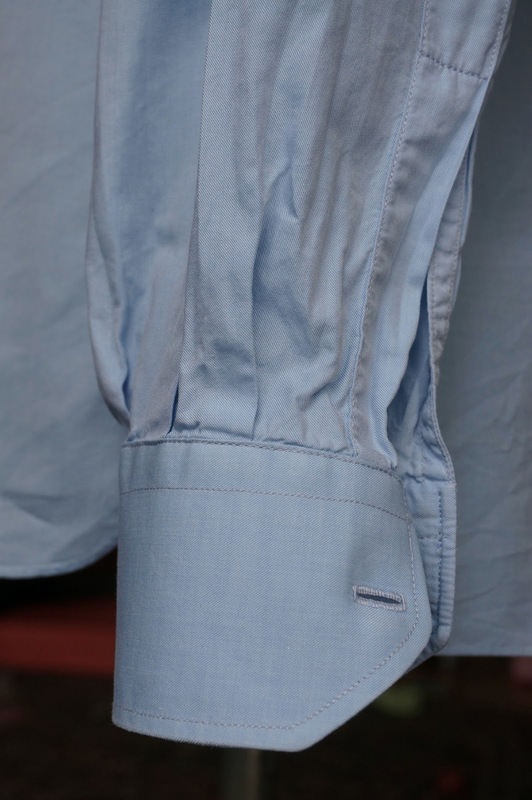 The cuffs are awful and the stitching is badly done. The hand stitching of the buttonholes is done with cheap thread, and where is the last button? Could you point out where I said it was better than Kiton? I’ll try and straighten out any inconsistency. And yes, thanks for the reminder on Passaggio. I’ve talked to a couple people about it but don’t have a definitive answer, and try never to publish anything that is not thoroughly substantiated. Simon, I wanted to thank you for helping me find Burgos of Madrid. I just received a wonderful green linen Teba jacket which with Carmen’s guidance (and patience) with taking my measurements myself, fits perfectly. Unfortunately I did not have the opportunity to visit Burgos in Madrid, but I am very impressed with the service that I received contacting Carmen by telephone and going through the process of selecting the fabrics, correspondence about measurements, the ordering and in the end receiving exactly the Teba jacket that I had in mind! After also reading your article about their shirts, I am certain that I am going to become a loyal Burgos customer. I also made a shirt there recently, and i just noticed that i picked up the same fabric as you did. I am very satisfied with the quality of the shirt and the work. I am a client of Simone Abbarchi of Florence and i have to point out it is unlikely that I switch given the price difference. I am not convinced the extra hand work is really worth it. I would like to know what you think. 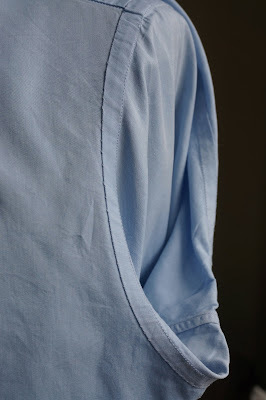 I’ve written about handwork on shirts in a few other places. Look up pieces on D’Avino for example. Generally, there is some handwork that is useful – around the attaching of the collar, and the sleeve, for example – but most else is purely aesthetic. And it wasn’t necessarily executed that well at Burgos either. Hey Simon read up this back post after having a look at burgos in the pop up going on at the moment. When you say the sleeve head was handstiched does this mean the whole join between the sleeve and the body of the shirt? Ive heard neopolitan makers saying this helps with the movement of the shirt, is this true?